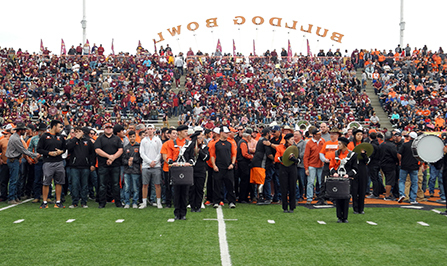 Players and coaches from past state champion Artesia High School football teams gather amidst the AHS band at halftime of Saturday’s Class 5A title game at Bulldog Bowl. With at least one member of the program’s first state championship team in 1957 present, former coach Vernon Asbill estimated all of the 29 title-winning teams were represented. Asbill also informed the 2017 Bulldogs following their 48-14 win over Belen that special coins would be struck commemorating their achievement as they join the classes of ‘57, ‘67, ‘87, ‘97 and ‘07 as state champs from “lucky No. 7” years.